The Blue Technologies Group announced the immediate availability of blue-tec Stapler 1.0 on Monday. Stapler combines a notepad, outliner and to-do list in one application. 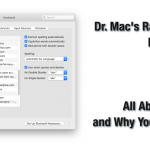 The notepad supports Rich Text, and the built-in spell checker and dictionary functions from Mac OS X. The outliner supports drag and drop organization, and to-do items change color when checked off. blue-tec Stapler 1.0 is available for download at the Blue Technologies Web site, and is priced at ?7.50 (about US$9.13). blue-tech Stapler is a Universal Binary application, allowing it to run natively on PowerPC and Intel-based Macs, supports Spotlight searching in Tiger, and includes English and German localizations.